The Profession of Social Work provides a broad overview of the history, scope, values, ethics, and organizational framework of the social work profession. Exploring professional ethics and human rights, evidence-based practice, and practice-guided research as well as emerging trends and issues, this important book presents topics of critical importance to anyone considering a career in social work. Each chapter offers an array of pedagogical features, including Key Terms, Review Questions for Critical Thinking, and Online Resources. 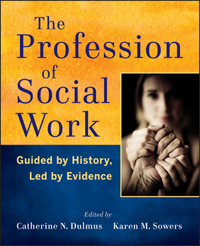 Ideal for introductory courses for both undergraduate and graduate students, The Profession of Social Work features coverage closely aligned with social work accreditation standards and includes chapters authored by established scholars on topics including social work history, social work education, professional credentialing and regulations, values and ethics, the strengths perspective in social work practice, evidence-based practice and improving the scientific base for social work practice, and contemporary issues in social work.